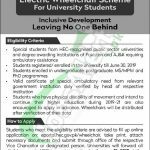 From Govt of Pakistan PM Electric Wheelchair Scheme 2019 Apply Online Detailed Eligibility Criteria is announced today. For all the disable persons the Prime Minister has launched a scheme named PM Electric Wheelchair Scheme this year 2019 for special disable persons and that's why it launched this scheme for distributing 500 Motorized/Electric Wheelchairs to empower special students (having ambulatory disability) studying in HEC recognized Public Sector Higher Education Institutions (HEIs) in Pakistan and the State of Azad Jammu & Kashmir. Coming to its motto, this scheme is launched to empower and strengthen the skills of special students in order to enable them to contribute equally to the economic development of the country so that besides institutionalizing inclusive development – leaving no one behind so that each one of us participate in national development process equally with dignity and self-pride. HEC which is abbreviated as Higher Education Commission is the executing agency of the scheme. Now, I will let you know about its further details below. All those students who belong to HEC recognized Public Sector Universities and degree awarding institutions of Pakistan and AJ&K requiring ambulatory assistance are welcome to apply. All those students who got enrolled in Undergraduate/Postgraduate and MS/M.Phil & Ph.D. Programs are required to apply. All such special cases applicants should bear the Valid certificate of special ambulatory need from relevant government institution duly verified by a head of the respective institution. Interested and willing special applicants are required to register themselves online from eportal.hec.gov.pk/wheelchair. Applicants need to take out the print of online application and attach all the necessary and submit through Office of the respective Vice Chancellor or designated person.